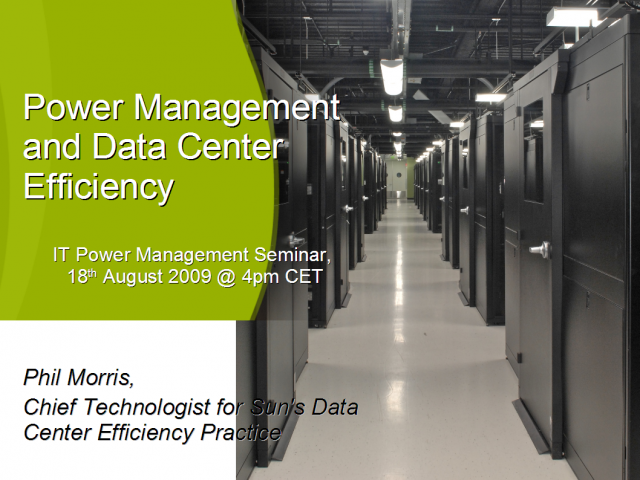 Learn how implementing power knowledge and management can save power, space, cooling needs, management costs and carbon footprint. Phil Morris is a Technical Director and Chief Technologist at Sun Microsystems and has won the President's Award for his contributions to the Sun/SAP Competency Centers and Sun Professional Services SAP Practice. Phil's current specialty is around eco datacenters, including facilities planning, architecture design, cooling and airflow analysis, and maximizing power efficiencies utilizing consolidation, virtualization, and overall power savings and reduction of the carbon footprint. He has been an acknowledged leader within the company for over eight years.